Available from Saturday 22 December, 2007 at 10:00am. A revival of the Emerald Project’s masterpiece. The Emerald Project aims at developing new repertory for the New National Theatre Ballet Tokyo by encouraging choreographers in Japan and throughout the world to create new narrative ballets. 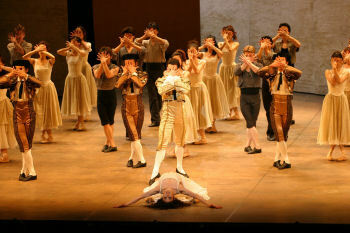 This is a revival of the first of the project’s ballets, which was premiered in 2005. It won acclaim for the psychologically nuanced way in which Carmen and José’s encounters were depicted by the choreography, and for the fiery and passionate performance of the dancers. The revival promises to be an even deeper exploration of this drama. The seductive Carmen is the focus of male attention. Having touched off a brawl, Carmen is arrested, but she throws a rose at her guard, José, who is smitten and allows her to escape, and even draws his sword on his superior officer. At first Carmen returns José’s feelings, but eventually her fickle heart is drawn to a famous toreador, and out of jealousy José stabs her to death.